Nothing about this particular aircraft is easy. And I mean nothing. Even photos of it that are verifiable are very difficult to find. I have seen perhaps less than 10 different verifiable photos of NC-41882 , Sikorsky VS-44A , Exeter , that I can remember. Some are shown on this page. It was very likely the least photographed by far of the 3 Sikorsky VS-44A's built. I flew on sister ship NC-41881 , Excambian , as I recall, in early August 1967. That day I really fell in love with the aircraft - a love affair touching 6 different decades now. Since the early 1980's I have wanted to salvage, recover, and restore the last of the VS-44's; the Exeter. Talk about getting hung out to dry... I am getting on in years now, and although I can't do it at this point in my life, for a number of reasons, that doesn't mean it should not be done. The restoration of sister ship Excambian, NC-41881, took 11 years, hundreds of thousands of hours, and lot of money, perserverance, blood, sweat and effort. The restoration of NC-41882, Exeter, would be much more difficult. To say it would be a monumental task, to do it properly, is an understatement. However, the end result, if done correctly, would be nothing short of fantastic ! Buy and see the film: The Queen of the Sky, from the gift shop at the New England Air Museum, in Windsor Locks, Connecticut. 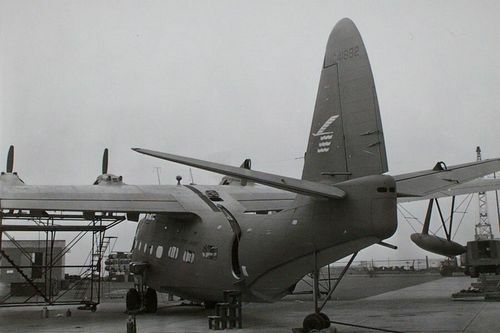 Read the Book: Sikorsky VS-44 Flying Boat, by Harry E. Pember. Cornelius J. (Ken) Dineen, was the flight engineer on the Exeter's final flight, survived the crash, and went on to be a restoration volunteer, for Excambian, NC-41881. In the book he gives an excellent first hand account of the crash of the Exeter on pages 32 -34. Assuming the aircraft is technically in Uruguay, one would need to see if the government, would allow release of the aircraft, and if there is a monetary cost in doing so. Getting a salvage crew down there, and the proper treatment of the metal of the aircraft once it comes out of the water so it does not deteriorate rapidly would be paramount for preservation. See how much US customs would charge, if anything, to bring the aircraft back into the United States. Do I expect anyone to set up a dedicated group to do it ? No. I really do not think anyone out there has all the components it would take to do it properly. It only makes sense to suggest it. Without suggesting it, it is even less likely to come to fruition. If seriously considering the project, I would like to hear from you. 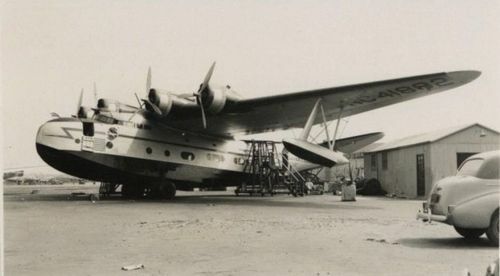 The last VS-44A, c/n 4404, NC-41882, the Exeter, crashed on the Rio de la Plata, Montevideo, Uruguay, South America, while making a night landing on August 15, 1947. At the time, of the accident, the aircraft was carring arms. In the early 1980's, divers went to the aircraft, and recovered some of the arms from the aircraft. The aircraft was reported to be reasonably intact, with the wing broken off. One of the engines was reported to be hauled ashore. The location is reported to be near the Punta Brava Lighthouse. 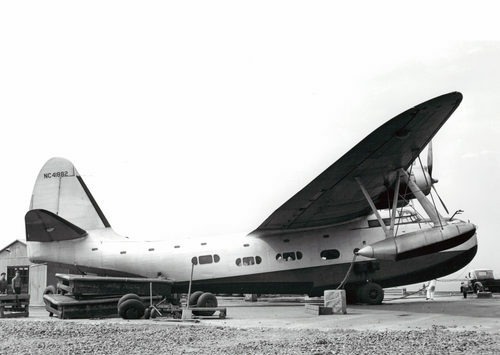 It is still probably there, and would probably make an excellent candidate for recovery / salvage, restoration, and static display, like its' sister ship c/n 4403 NC-41881, the Excambian, which is now on display at the New England Air Museum, Windsor Locks, Connecticut. Sikorsky VS-44A Exeter NC-41882 in the markings of Skyways International Airways circa April 1947 - August 1947. 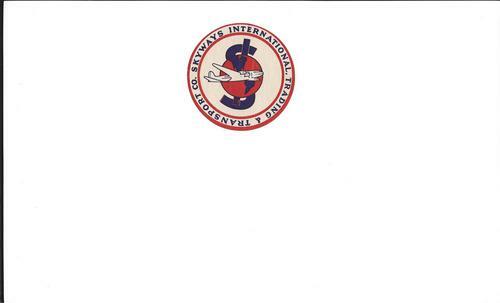 Right: Skyways International Logo similar to the one in the photo above, below the port side cockpit window. 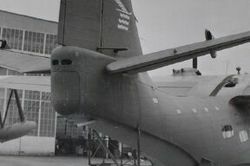 Right: Sikorsky VS-44A NC-41882 Exeter nearing completion at the Sikorsky Plant , June 15, 1942, painted in the wartime markings of American Export Airlines. Left: Exeter rear quarter starboard view, June 15, 1942.